DATEL's AA family supplies up to 40 watts of output power in a standard 1.0" x 1.0" x 0.4" package. This family offers high efficiency up to 89% and 2250 Volts of DC isolation. The AA series feature ultra-wide input voltage ranges of 4.5 to 9, 9 to 36 or 18 to 75VDC and single or dual outputs in an open frame or encapsulated package, while providing precise regulated output voltages. 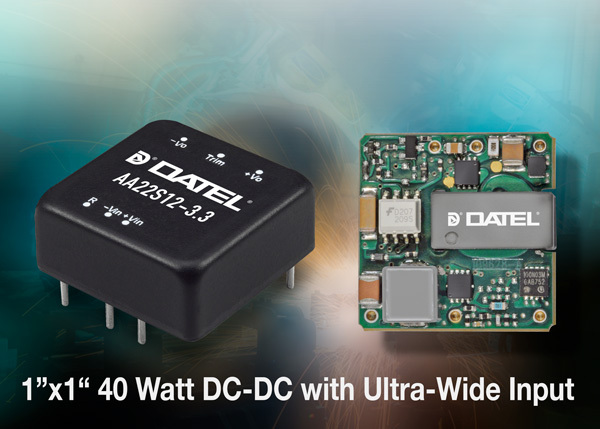 DATEL Inc. has announced the introduction of a new 1x1 (AA) series that can deliver up to 40 watts of power. This new line of high power-density DC-DC converters from DATEL is the preferred choice for military, industrial, distributed power architectures, telecommunications, and mobile applications. Offering industry-unique 4.5-9V, and ultra-wide 9-36V or 18-75V input range, this AA series delivers efficiencies up to 89%. Standard output voltages can be trimmed to customer-specific values. These converters offer Input Under-Voltage Lock-Out (UVLO), and are fully protected against output overvoltage and over-temperature conditions. All models have internal over-current and continuous short circuit protection. This AA series is offered in the standard (1" X 1" X 0.4") footprint and operates over the extended temperature of -40°C to +123°C. It features a positive or negative On/Off Control function and 2250VDC of isolation. In addition, this AA series can be supplied with encapsulated or SMT options. Please contact DATEL if your application requires customized input/output voltages, alternate pin-out, alternate packaging, UL/CSA60950 or CE Mark 2004/108/EC Certifications. Other options available from DATEL include models optimized for lower power/cost, such as 10, 15 and 30 Watts versions. DATELâ€™s data acquisition, including A/D and D/A Converters, CCD Signal Processors / Imaging Converters, Single-Package multi-Channel Data Acquisition Systems, Custom System-in-a-Package (SIP) Hybrid Solutions, Sample/Hold Amplifiers and other products are designed and manufactured in a MIL-PRF-38534 hybrid certified fabrication facility located in Mansfield, Massachusetts, USA. DATEL product offering has grown to become one of the industry's broadest, designed to meet the ever-changing requirements of military, HI-REL, medical, scientific and industrial applications. DATEL is ISO-9001 certified, and ITAR registered.